Amber Jamison drives to the basket. The junior guard has taken a “leave of absence” from Northwestern and will not play this season, coach Joe McKeown confirmed Thursday. 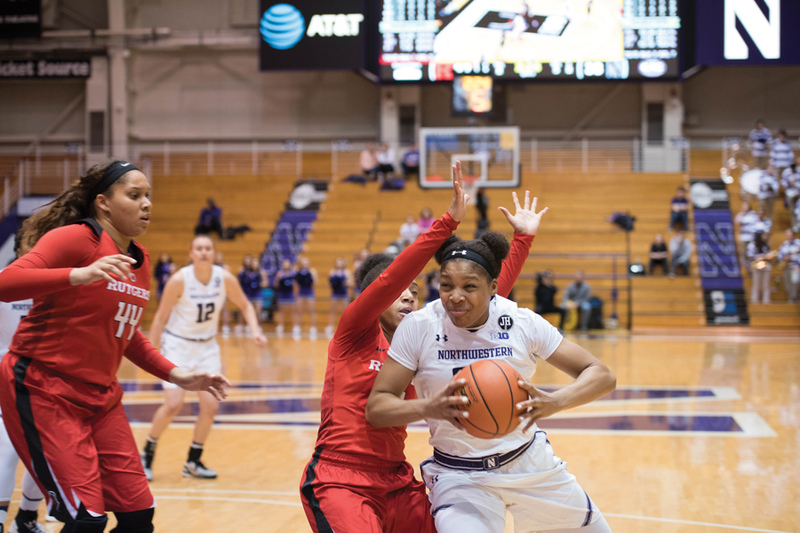 Junior guard Amber Jamison has taken a “leave of absence” from Northwestern, coach Joe McKeown confirmed Thursday. An athletic department spokesman announced the news before the Wildcats’ 88-70 home-opening win over Oakland on Thursday. The spokesman also said Jamison would not play again this season. “She brought a lot of spirit to our team and I think she still is going to give us that spirit even when she is from home,” sophomore forward Abi Scheid said. Jamison was expected to be a big contributor to the Cats this winter. Among returning players, the 6-foot guard was second in scoring and second in total minutes played last year. She was also named a team captain by McKeown before the season. In the team’s exhibition game against Missouri-St. Louis, Jamison played 18 minutes and shot 1-of-7 from the floor, finishing with two points. The junior did not play in NU’s season opener at Chicago State last Friday, which the Cats won decisively. The loss of Jamison reduces the active roster to only 10 players and five guards. Of those five, only senior captain Lydia Rohde had previously played significant minutes for NU. Starting in Jamison’s place is freshman guard Lindsey Pulliam. Pulliam, a top-100 recruit according to ESPN, has made the most of her opportunity thus far. Against the Golden Grizzlies, the Maryland native finished with 14 points on 5-of-12 shooting, all from within the 3-point line. In the season opener against Chicago State, Pulliam led all scorers with 18 points and collected six rebounds. Sophomore guard Byrdy Galernik has also played well off the bench to start the season. She scored 8 points and dished out three assists against Chicago State, and tallied 5 points and three assists against Oakland. Without Jamison, the team has struggled from beyond the arc. The junior was the leading returner in 3-pointers made, as well as in 3-point percentage among players with at least one attempt per game. Last Friday, the Cats did not convert any of their eight 3-point attempts. Though NU improved against Oakland, going 5-for-10 from deep, 3-point attempts accounted for only 15.9 percent of the Cats’ overall looks. Though the team will miss Jamison’s in-game contributions, Scheid said that “we always know she will be there for us” off the court. Jamison will not step on the court of Beardsley Gym in the near future, but McKeown said her NU career is not over.